FILE - A Syrian Democratic Forces flag flutters on a damaged building in the town of Baghuz, Syria, March 23, 2019. More than a week after declaring victory over Islamic State’s self-declared caliphate, U.S.-backed forces are still trying to clear the terror group’s last stronghold of its fighters. A spokesman for the Syrian Democratic Forces tweeted Tuesday that clearing operations in the northeastern Syrian town of Baghuz included an ongoing hunt for IS members who have yet to give up the fight. 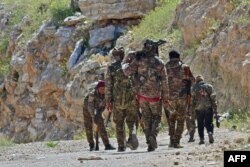 Separately, the London-based Syrian Observatory for Human Rights said its observers in Syria estimate there may be as many as 4,000 to 5,000 IS fighters and operatives in areas controlled by the SDF. SDF officials declared victory over the IS caliphate March 23 following several nights of heavy airstrikes against multiple clusters of several hundred fighters in Baghuz, that had refused to surrender following a protracted siege. Top U.S. officials also warned the collapse of the IS caliphate would not mean an end to the fighting, noting U.S. intelligence estimates suggested that, at minimum, there are still “tens of thousands” of IS fighters spread across both Syria and Iraq. FILE - Fighters with the Syrian Democratic Forces (SDF) patrol near the town of Baghuz, in the Syrian countryside, March 20, 2019. “We've thought for quite a while at this point that ISIS' strategy was to conduct the clandestine insurgency in Iraq,” a senior defense official said shortly before the SDF declared victory, using an alternate acronym for the terror group. Just last week, U.S. envoy for Syria James Jeffrey, echoed those sentiments. Much of the concern in Baghuz has centered around the caves, as well as what U.S. and SDF officials have described as an extensive network of tunnels, some of which are believed to run for several kilometers. Experts have also raised concerns about IS’ ability to conduct successful insurgent operations based on its history as an insurgent force prior to the declaration of its caliphate in 2014, as well as the ample time IS leaders had to plan for the caliphate’s collapse.